The hands-on role of the designer in the Industrial Design Process is nearly coming to its end for the current year’s production cycle. However, there's still a lot of work to do to maintain the design integrity through production. What is the role of the factory and how does the 3D CAD file get turned into a physical product on the shelf? The following article discusses the role of the factory, designer, CAD modeler and PM as they follow their product design through the remaining processes at the factory and into retail. Factories own or have access to machinery that can allow for better quality prototyping and one-off parts creation, along with the resources to cut tools. They may outsource certain aspects or components of a particularly complicated design to specialist companies and contacts. The method of selecting a factory often depends on the size of a product development company or agency. Some have partnerships with factories, while others have partial or full ownership, and some will do one off deals to manufacture a small run of product. Depending on the size of the company, factories won’t always take on a job. Often, a line of credit must be established to ensure costs are covered or, alternatively, a guaranteed order with an attached minimum order quantity (MOQ). The factories' business model may be on a development service charge basis or based on a cut of revenue. As with most commodities, the cost of a product is often a leading factor in selecting where it'll be manufactured. Cost of labor and materials are generally the largest cost incurred during production. A lot of manufacturing is still undertaken in the Far East and Asia, due to lower costs in these areas. However, sometimes other considerations, such as the relative size of a product and its associated shipping costs or a particularly high requirement for quality, may dictate domestic manufacturing within the US or Europe. One of the few ways to bring down the cost of manufacturing is to produce items in volume. Sales teams will have already been hard at work demonstrating the product to potential buyers and retail partners with the use of prototypes, sales boards and animations; during these meetings they'll have gauged interest in the product and inquired as to the potential number of units that'll be purchased. These numbers can be used to negotiate cost and production runs with the factory, particularly if the company has a trusted track record of fulfilling production quantities. Up until now the factory has been involved with the product development at a relatively low level. They've been kept informed of developments with regular meetings with the designers and the PM and may have made a prototype or two. At this stage the factory will be given a lot more information to work with, and production work can begin in earnest. The refined, in-house CAD is now handed off to the factory. The designer, CAD modeler and PM will all visit and liaise regularly with the factory to make sure the design integrity is maintained and to make and monitor any necessary modifications to the design/CAD or surfaces. On receipt of the CAD, a period of study generally ensues with the factory analyzing the design, components therein and also beginning to get an idea of how the product will be assembled and manufactured. This can take anywhere from a few days to several weeks. The CAD will likely be rebuilt in SolidWorks or Pro/Engineer. The factory will add draft angles, fix any major issues with undercuts (parts of a design that'll get stuck in the mold when trying to be removed), parting lines, wall thicknesses, screw bosses and reinforcements, make alterations for production techniques and even considerations for how the plastic will flow into the mold. All of these factors can influence the shape and appearance of the design. It’s down to the designer and the PM to stay abreast of any changes made and make sure they either offer alternatives to avoid major impacts on design or alter their design accordingly to accommodate manufacturing and aesthetics. As mentioned in previous articles, the more experienced the designer or CAD modeler the lower the likelihood of major surprises and design impacts during production. Certain off-the-shelf parts will also be sourced which, up until now, have been represented by prototype pieces. In addition to the CAD being handed off, a finalized play spec document will also be passed on by the PM. This is an evolution of the same document mentioned in the first article of this series, Breaking Down the Industrial Design Process, with a great deal of refinement and additions. It will list interactions with the item and any audio or visual feedback it may give. In the case of an electronic toy, this can be a very in-depth section of the document with many interactions and responses occurring. A schematic will also be given to the factory identifying electronics components, configurations and power sources. Along with the technical side of things, a deco plan is also provided. This is a set of diagrams of the product showing several views. Parts will be colored and called out with Pantone numbers and suggested texture finishes. There will also be an indication of estimated or expected factory costs for the item. This will have been calculated very early on in the item's existence and will likely have been calculated by working backwards from the item's suggested retail price (SRP). The factory cost will be the lowest cost possible, based on material cost, labor, tool cost, factory markup and packaging. Freight packaging will then be added along with shipping cost. This will then be multiplied by an appropriate factor to sell to the retailer, and then the retailer will mark up the cost further to sell to the consumer. Using all of the aforementioned information, the factory will begin working toward production. 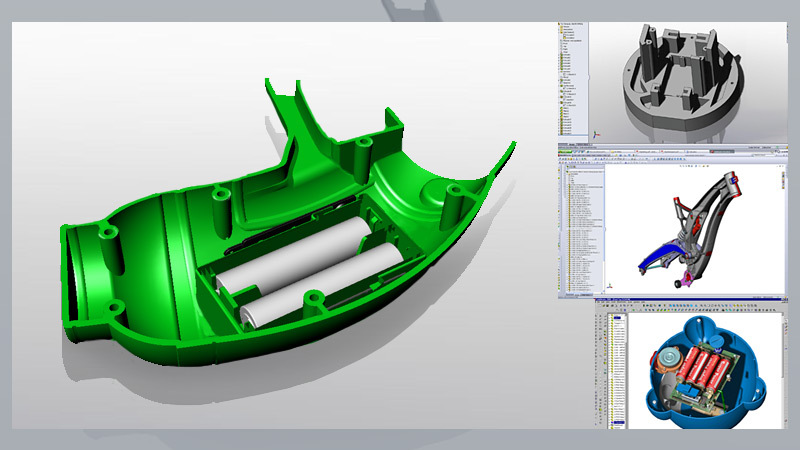 They'll continue to work on the CAD and to refine the component list and sourcing. The estimated cost will turn into a more concrete document in the form of a Bill of Material (BOM). This is an itemized list describing each component and the quantity of each component in the product, along with an associated unit price and cost to assemble. By its nature this is a very factual document so if its grand total doesn't match the estimated cost then some negotiation will ensue. If the numbers are close, then the markup can be altered or other factories can even be consulted to see if they're comparable. If the numbers are far apart, then the product may need significant alteration, reduction of features or even be considered to be dropped all together. Again, with experience, this shouldn't happen as the product development team normally has a reasonable idea of what the basic components and parts should cost. Once several CAD reviews have occurred between the designer and factory teams, a high-quality prototype will be produced, commonly referred to as a ‘hand sample’. This will be a CNC (Computer Numeric Control), a SLA (Stereolithography), or a very high resolution print. It'll have all of the intended internal surfaces, bosses, supports and fitting present and may have even have all of the internals present as well, such as battery box, circuit board, wiring, speakers, motors and LEDs. It's likely this model will have had some hand finishing on the external surface but likely will remain in grey primer. At this point the designer can get a real look at exactly what will go on the shelf and can make comments and minor modifications, often drawing and highlighting minor changes on the model itself. The factory will of course advise if any of these suggested changes are contrary to their efforts and will agree to make changes to the model and respective CAD. The factory will have had a chance to modify the hand sample according to the designer's feedback and may then use the deco plan to paint the model with its final intended colors. At this stage it's unlikely to include any textures unless they're particularly important to the product's success. Upper management will now get a chance to review and sign off on the product, along with showing it to various interested parties and buyers. Once this sample is approved, anywhere between several and many more may be produced to use in sales and marketing efforts. These are expensive however! Most products come with an IM, in some cases, because the product is complicated and in others because it's required by law in certain countries, if, for example, there's a power source involved. Illustrations and views of the production CAD will be used to populate the IM pages. 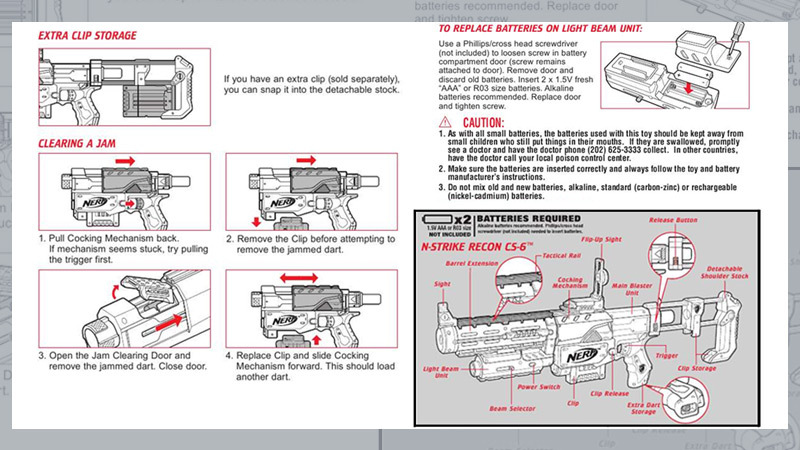 Production CAD is necessary as the IM must accurately reflect the final design to avoid any confusion with the user. China also dictates that all imagery in IMs or packaging must accurately depict the product before it can pass through export. Now that the CAD is signed off and approved, a tool will be cut. It's generally cut in steel for large volume, but can vary for lower volume production or if a specific method is required. There are various milestones in tooling. 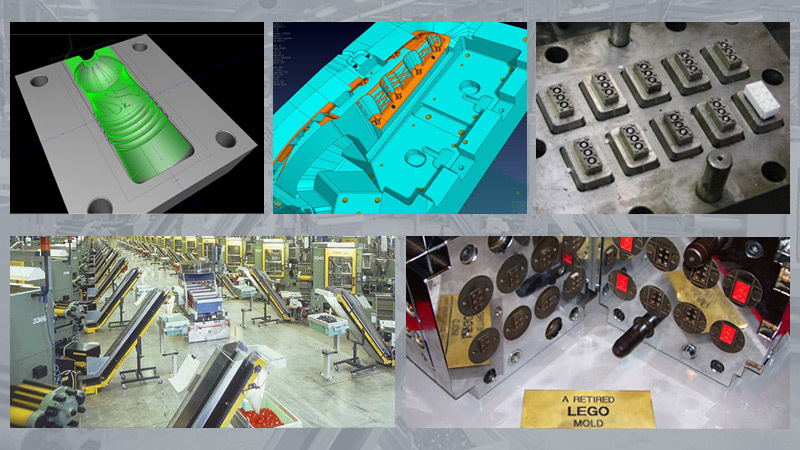 Before cutting a tool, a tooling plan is created to identify what will be molded. This may separate out parts in differing materials or colors and also make considerations as to how parts will be configured in the tool. This may be dictated by economy of space, how a particular part will come off the mold or how injected material will flow through it. Tooling production begins with ordering the mold base material. The tool is designed and cut using specialist software specific to the task. Considerations are made for placement of parting line, slides, cooling, sprues, runners, ejection pins, etc. Simulations are often run to make sure the mold is completely filled. Once the steel is cut, various stages of molding will occur to test the mold and see how parts perform and appear. The tool will be modified as needed to ensure the parts are as refined as possible with steps taken to remove mold lines and flow marks. Initial plastic parts are created from the new tool. These parts will be used to identify early issues with the mold. This is the first assembly of all the molded parts and components and is built by trained engineers, not production line workers. The aim is to build a functioning prototype with final tooled parts. This stage may also be used to test proposed materials and colors in the mold to identify any potential problems with flow marks in the plastic. This is a refined version of the previous build using molded parts. It'll be a functional sellable product, including all features, functionality, deco and packaging, again, built by trained engineers. These parts can now be used to populate sales efforts such as trade shows if needed in low volume. The final stage before full production is the conversion from FEP to a product built on an assembly line by factory workers. One final very important part of the process is making sure the product will stand up to everyday use. These tests are comprised of somewhat extreme use case scenarios to make sure the product will last under duress and repetitive use. These tests are often particularly stringent when toys are involved. By this point in the product cycle, the sales and marketing machine should've been in full swing for quite some time. Sales staff and marketing teams will further support their effort with the new and improved molded products to seal deals and create new campaigns and ideas. Trade shows will be attended, television commercials created, social media programs populated, along with coordinating promotions and launch events. What’s Next for the Designer? By this time of the year, the designers will have followed their design or several designs all the way to production. They may attend some of the trade shows to seek feedback to improve and inform future products, but their main task is to start all over again with next year’s ideas and products! We've now covered all aspects of the design process from the initial high level strategic documents, through sketching, illustration and elevation to CAD and, now, the factory. We covered many skill sets, people and software packages as we brought a product from blank white page to the shelf and into the consumer's home.